After several quiet years, Arizona has had a very active wildfire season. 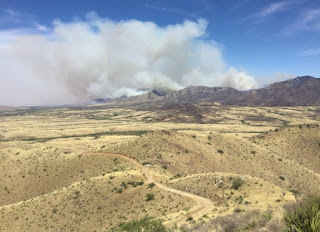 Halfway through 2017, just over 352,000 acres have been burned in Arizona by wildfires of >100 acres in size (Inciweb for Arizona: https://inciweb.nwcg.gov/state/3/). This was the worst fire season since the record burns of 2011, and is almost 4 times as many acres burned than in 2013 (Table 1; Southwest Coordination Center: https://gacc.nifc.gov/swcc, accessed July 12, 2017). While the worst part of the fire season is likely behind us, based on recent years we can expect to see more wildfires in the fall. Most of the 2017 burned acreage has been on land managed by the U.S. Forest Service (USFS), followed by Arizona State lands (AZFD), Bureau of Indian Affairs (BIA), and Bureau of Land Management (BLM) (Figure 1). As the monsoon season ramps up, it is time to be cognizant of potential post-fire flooding and debris flows. Both floods and debris flows pose significant hazards to human health, property and infrastructure, and both carry a significant amount of sediment, woody material and rocks. Debris flows can be more dangerous, however, as they resemble slurries of dense, fast-moving concrete that carry more sediment and woody debris and larger caliber rocks (maybe up to basketball sized rocks in floods and car or truck sized boulders in debris flows). Proportion of land burn by wildfires in the first half of 2017. Wildfires significantly impact watershed hydrology, causing much more runoff to occur and frequently triggering post-fire floods and debris flows. In the absence of wildfire, unburned vegetation intercepts raindrops, mitigating the impacts of high-velocity drops on soils. Depending on the burn severity of the wildfire, interception of rainfall by plants can be severely reduced or completely eliminated. At the same time, infiltration of water into the soil is impeded by the presence of ash and fire-related changes to soils (e.g. hyper-dry soils, hydrophobicity, and the destruction of organic matter). These changes result in increased runoff volumes and velocities such that smaller, short-lived monsoon storms can generate tremendous runoff, flooding, and debris flows, and do a huge amount of geomorphic work (i.e. erosion and transportation of sediment) in a very short period of time. Over the past several years, AZGS has worked with US Geological Survey researchers to assess geomorphic responses (no response/flood/debris flow) of burned basins to rainfall events. The objective; to better understand what intensity level of rainfall triggers post-fire debris flows. These data can inform the National Weather Service decision-making in issuing formal warnings. This summer I worked with Dr. Luke McGuire (UA Geosciences) to instrument five, small (~< 1 sq. 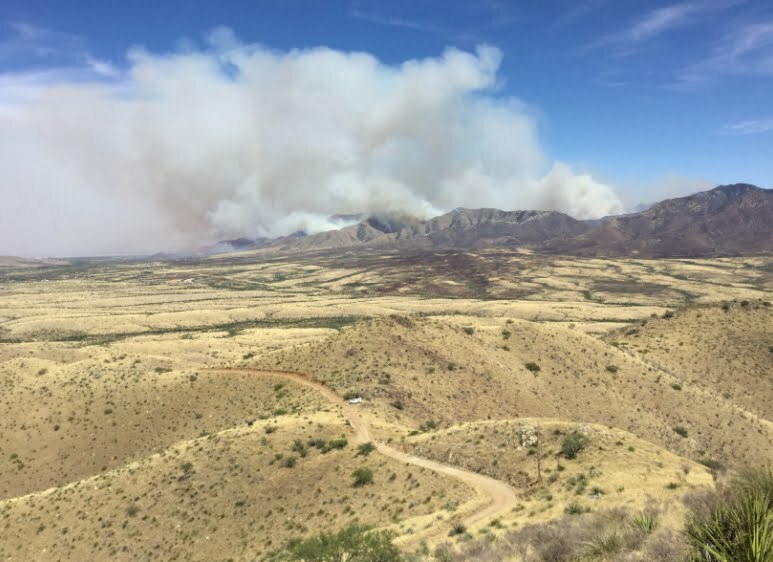 mile) burned watersheds on the Pinal Fire near Globe to monitor the timing of post-fire debris flows in relation to rainfall. Without information regarding the timing of flow, the assumption is that the triggering rainfall intensity is the peak intensity. A more likely scenario, however, is that post-fire debris flows are triggered before peak rainfall intensity. Data from Dr. McGuire’s study will help us refine those triggering rainfall intensity thresholds. If you live downslope from federal lands burned by wildfires, contact your county emergency management office to find out if you are in danger from potential post-fire floods or debris flows. This information will have been determined by the U.S. Forest Service’s Burned Area Emergency Response (BAER) team (https://gacc.nifc.gov/swcc/information/learn_more/baer.htm). If you are in an area of concern, contact your local National Resource Conservation Service agent to find out what mitigation measures, if any, are appropriate for your property. You should also consider buying flood insurance immediately; if you are below a burned area on federal lands, there is no waiting period for flood insurance to take effect. Remember to stay safe, and don’t enter flowing washes or drive around barricades.